Tracfone LG Ultimate 2 Android Smartphone now Available! 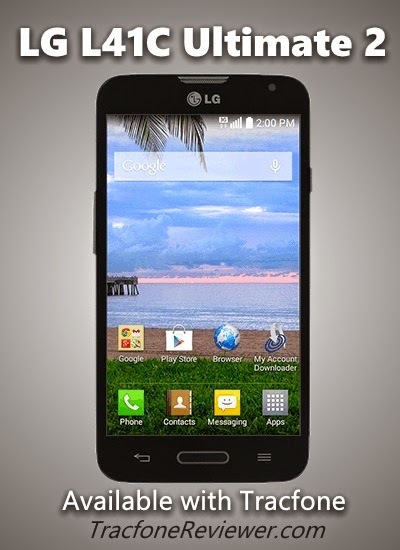 Below we will share details and specs for the LG Ultimate 2 which was recently made available for use with Tracfone. TracfoneReviewer will continue to update this post as more information becomes available. Note: The LG Ultimate 2 is now available with Minutes Bundle from eBay! See the last section below for links to the phone on both Amazon and eBay. Another Android powered smartphone for use with Tracfone, has been released and it is the LG L41C, also known as the LG Ultimate 2. Tracfone continues to release newer, and slightly better, smartphones for use on their prepaid service. The LG Ultimate 2 comes with Android 4.4 OS, a 5MP camera with autofocus, 1 GB RAM and uses Verizon 3G cell towers. It also havs a 4.5" screen, which will make many Tracfone users very excited. Along with the LG Ultimate 2, there are several other Android phones coming, or already available for use with Tracfone. The http://innaz2.blogspot.com /2014/06/lg-l34c-optimus-fuel-review.html">LG Optimus Fuel, http://innaz2.blogspot.com /2014/06/samsung-galaxy-ace-style-s765c-coming.html">Samsung Galaxy Ace Style, and http://innaz2.blogspot.com /2014/10/tracfone-moto-e-xt830c.html">Moto E are some of the other options. You can also see the full list of smartphones by visiting our http://innaz2.blogspot.com /2014/07/tracfone-android-list.html">Tracfone Android Smartphone List. The http://innaz2.blogspot.com /2014/10/alcatel-a564c-onetouch-icon-pop.html">Alcatel A564C Onetouch Icon Pop was also released by Tracfone, and we will be posting more on that very soon. It has a 5" screen, and Android 4.4, as well as a quad care processor. Tracfone has a number of phones that they may be releasing in the future, like the Moto E, and possibly several Android phones for use on GSM networks. Keep up with our latest news and posts by following us on Facebook. Now, let's take a closer look at what to expect from the LG Ultimate 2. Many of the details about the LG Ultimate 2 have become clear over the last few months that the phone has been available. It has become widely accepted as one of the best phones currently available from Tracfone, a long with the Moto E, and Alcatel Onetouch. The LG Ultimate 2 has already been spotted for use with Straight Talk, and at a price of $130. It is also now listed on the Tracfone website for the same price, but is available from many online retailers like Amazon, eBay, HSN, and others, for just over $100. The Ultimate 2 is basically very similar to the Verizon prepaid LG Optimus Exceed 2. which appears to be a well rounded smartphone. You can expect easy viewing on the LG Ultimate 2's 4.5" touchscreen (800x400) that will make it bigger than the LG Optimus Fuel, Moto E, or http://innaz2.blogspot.com /2014/04/lg-optimus-dynamic-ii-review.html">LG Optimus Dynamic II. Only the Alcatel Onetouch Icon Pop has a larger screen at this time, at 5". As mentioned above, the dual core processor and 1 GB RAM give the Ultimate 2 good performance, and the ability to keep up with almost any app currently available for Androids. Many consumers are extremely happy to have the opportunity to upgrade from single core, 512 MB phones. Another great feature that may be the most important for some people, is the amount of internal memory available for loading apps and other things. Initially it appeared that the LG Ultimate 2 would have 4GB of Internal Memory, with somewhat less than that actually usable. However, it has been reported that there is over 4GB of usable space on the LG Ultimate 2, meaning that it probably comes with 5GB or more of internal memory. The Cameras on the LG Ultimate 2 are nothing amazing, but if you've been stuck with the cameras on older phones it will be a refreshing upgrade. The Ultimate 2 comes with a 5MP rear camera, and 1.3MP front camera. Both a capable of good pictures, and the rear camera has autofocus for reading bar codes etc. Below is a list of the features and specifications for the Tracfone LG Ultimate 2. First the features, and below the technical specs for the LG L41C. 5.01" x 2.63" x 0.38"
The L41C has some decent specs, with 1 GB of RAM, and a nice large screen, almost a full inch large than the previous phones. While the battery is a decent size at 2100 mAh, the talk time and standby are less than the Moto E (which only has a 1980 mAh battery). It should last a full day with moderate use, but if you need a long battery life, the http://innaz2.blogspot.com /2014/10/tracfone-moto-e-xt830c.html">Moto E does an excellent job managing power consumption. Also turning GPS, WiFi and Data off will help conserve battery life. Many of the other specs on the Ultimate 2 are a big improvement over phones like the http://innaz2.blogspot.com /2014/04/lg-optimus-dynamic-ii-review.html">LG Optimus Dynamic II, http://innaz2.blogspot.com /2013/10/zte-valet-review-tracfone-smartphone.html">ZTE Valet, and http://innaz2.blogspot.com /2013/10/samsung-galaxy-centura-review-tracfone.html">Samsung Galaxy Centura. Tracfone was relatively quick in releasing the the LG Ultimate 2 and Alcatel Onetouch Icon Pop. We heard about the http://innaz2.blogspot.com /2014/06/samsung-galaxy-ace-style-s765c-coming.html">Samsung Galaxy Ace Style months ago, but it has not surfaced, and may even be a lesser option with these new phones now available. So how does the Ultimate 2 perform, and what are our likes and dislikes about the phone? Glad you asked! Let's jump right in. We've collected a lot of information from around the web, and even from user comments below to share as balanced a review of the LG Ultimate 2 as we can. We want to focus here on a few key features for the Ultimate 2 that make it stand out from other phones available from Tracfone at this time, and that might be important for those looking at buying this phone. The internal memory and RAM, screen size, and cameras are some of the biggest factors that may lead you to be interested in the LG Ultimate 2, so let's take a closer look. The internal memory for the Ultimate 2 is the space available for installing Android apps, and saving other data like pictures. The Ultimate 2 comes with over 4 GB of usable space, which is a lot compared to the 2 GB or less available on most other Tracfone smartphones. And some apps and data can even be transferred to an external SD card, freeing up additional space. 1 GB of RAM and a dual-core processor are about the minimum needed these days to comfortable run all the popular apps on an Android smartphone, and the LG Ultimate 2 meets this just fine. Many users report 200 MB or more of available RAM at any given time, and if you use a speed boosting app you can get even more free space. For those that might not know, RAM basically allows you to run multiple apps at the same time. So more RAM means more things can go on at once without problems, and less RAM means less stuff at once. When you get to 512 MB of RAM or less, you start to run into issues with overloading the RAM, which causes apps to close and other annoying stuff. The LG Ultimate 2 has a 4.5" touchscreen. 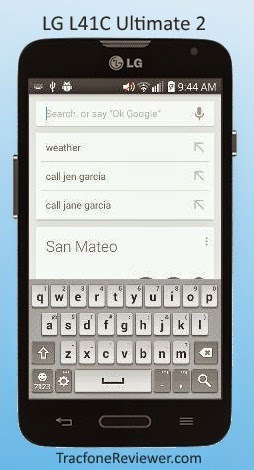 which is one of the biggest features for this phone. Previously, Tracfone only had phones with 3.5" to 3.8" screens, which may be fine for some people, but for others it is just a little too small. 4.5" is a nice screen size for reading, watching videos, typing on the virtual QWERTY keyboard, and really everything else. The only reason why one might not want a screen that large is for portability. But these days a 4.5" screen is average sized, and in no way uncomfortable to hold or use. Screen quality is very good, with 480x800 size, and 240 dpi. Finally, front and rear facing cameras with flash and autofocus are a feature many Tracfone users have desired for a long time, and the LG Ultimate 2 delivers. The 5MP rear camera performs well and functions as it should. You can scan barcodes or QR codes with it, and the image quality is one of the best for Tracfone devices. Remember that if you want to send an image, you need to turn on you data. Many users report being extremely satisfied with the Ultimate 2, as it is a phone with enough modern specs to keep up with other devices. The ability to have a smartphone running Android 4.4 on Tracfone's low cost network is a great thing. But now we do want to share a few negatives about the phone to keep in mind. First off, there is a lot to like about the Ultimate 2. It has a large screen, good cameras, great amount of memory available, good processor and RAM, and plenty of other things. But there are a few things to be aware of before you purchase it. Many of the negatives with the LG Ultimate 2 actually revolve around using it with Tracfone service, and so aren't directly related to the phone. However, since you must use this phone with Tracfone, we will cover them here. Our dislikes for the Ultimate 2 include using Verizon cell towers, splitting texts, calling and data up, tracking minutes, and it doesn't use the latest version of Android. If you already use Tracfone, and especially if you already use an Android phone with Tracfone, then you already know most of these issues. Tracfone currently only uses Verizon 3G CDMA cell phone towers for all their Android devices. This works great if you live in an area with good coverage. If you don't, then it isn't so great. You should check with friends or neighbors in your area to see if they use Verizon, and you can also enter your ZIP code on the Tracfone website and see if the Android phones come up, which will help indicate if there is good service in your area. However, if Tracfone doesn't show Android phones for your area, or tells you that you can't activate a smartphone at your ZIP code, that doesn't necessarily mean you won't get service there! Many users report activating their smartphone using a ZIP code from another area, and then having no problem with reception. Just be aware that you are taking responsibility for the risk. For all Tracfone Android and BYOP phones, prepaid minutes are split into three buckets or pools. You have calling minutes, texts, and data. All airtime is also tripled when adding it to the phone. This is generally a great deal for most people. However, for heavy texters, you might run out of texts more quickly, and there is no way to just buy more texts, you will have to buy a regular minutes card. This isn't a big deal for most people, but be aware of it. Tracking minutes on the Android phones isn't as easy as before. Older 'dumb' phones displayed your remaining minutes and service time on the home-screen, and this isn't possible on Android devices. But it is easy enough to go online to the Tracfone website and check your balance there, or download and use the Tracfone app (just search for Tracfone app in the Google Play Store). The LG Ultimate 2 runs on Android 4.4, which is no longer the latest version of Android. The latest is 5.0 lolipop, and the Ultimate 2 will not be updated to it. Don't worry though, Android 5.0 isn't really that great in my opinion, and mostly just changes the appearance for a lot of things, and adds extra steps for several functions. As a final negative for all the Android phones, you can't use http://innaz2.blogspot.com /p/tracfone-promo-codes.html">Promotional Codes with Tracfone Android devices. This isn't a huge deal, but for those that rely on the extra minutes, it is disappointing. Overall, consumers who haven't used a Tracfone device may be disappointed with the customer service, and sometimes limited coverage of cell service, but for everyone familiar with Tracfone, the service shouldn't be any different. Our opinion of the LG Ultimate 2 is very high, as it meets or exceeds many expectations for a good, modern smartphone. It is worth the money, especially if you buy it bundled with minutes. Two other Tracfone devices that are on par with the Ultimate 2 are the Moto E, and Alcatel Onetouch. We will quickly compare each of these phones to the Ultimate 2 in case you are considering them. The Moto E is a well designed budget smartphone in the same lineup as the Moto G and Moto X. The Moto E has a smaller, 4.3" screen, but it is slightly better quality. The Moto E doesn't have a front camera, nor autofocus or flash, which are deal-breakers for some. The Moto E also doesn't accept an external SD card, so you're stuck with just the internal memory. Battery life is probably better on the Moto E, but the battery isn't removable. Overall, the Moto E is a great phone, but the Ultimate 2 beats it in many categories. The http://innaz2.blogspot.com /2014/10/alcatel-a564c-onetouch-icon-pop.html">Alcatel Onetouch Icon Pop features a larger, 5" screen and quad-core processor. If you want the biggest screen available, the Onetouch is your choice. But users report some minor video lag when watching Youtube, and in general, the Ultimate 2 is a better all around phone. They both have front/rear cameras, and both 1 GB RAM. The Alcatel Onetouch has around 2GB of internal memory, which is a bit less than the Ultimate 2. So if you want the largest screen, go with the Alcatel, but otherwise, the Ultimate 2 is a slightly better choice. For some sample pictures, and more information on the performance of the LG Ultimate 2, check out this forum post. Each of the Android smartphones released by Tracfone have certain strengths and weaknesses and the LG Ultimate 2 is no different. You can take a look at the LG Ultimate 2 Interactive Tutorial to get a better feel for how the phone looks. We hope the information provided here was useful to you. Let us know your questions and thoughts about the Ultimate 2 in the comments section below. Also take a look at what others have to say. If you haven't already, take a look at our http://innaz2.blogspot.com /2014/12/best-apps-for-tracfone-android-users.html">List of the Best Android Apps for Tracfone users. As we mentioned, the LG L41C is retailing on the Tracfone website for about $130. However, it has recently disappeared from their site (likely it went out of stock) and cannot be purchased directly from them at this time. But you can buy it elsewhere with no problem, and often much cheaper! The Ultimate 2 has been available bundled with minutes on QVC and similar sites, but limited quantities. No word yet on when/if the Ultimate 2 will be available from other retailers, but we will update as more information comes in. There are plenty of cases for the LG Ultimate 2, because it is very similar to so other popular phones including the LG Exceed 2. You may find our http://innaz2.blogspot.com /p/tracfone-byop-phone-list.html">Tracfone BYOP page useful if you're looking for new phone options. It provides information on Bringing Your Own Phone to Tracfone, including some information on the success people are having with using the http://innaz2.blogspot.com /2014/11/use-moto-g-with-tracfone-byop.html">Moto G with Tracfone. Also take a look at our http://innaz2.blogspot.com /2014/08/how-do-minutes-work-on-tracfone-android.html">Guide to How Minutes Work with Android Tracfone Devices. Tracfone changed things in several ways with the Android phones they now offer, and the article explains the changes, and what difference it makes for you. If you don't fully understand how Tracfone works, and the options available, take a look at our http://innaz2.blogspot.com /2014/12/new-to-tracfone-start-here-tracfone.html">Beginners Guide to Tracfone which lays out the basics for how it works. Thanks for visiting! Check the comments for lots of additional information posted by readers! hopefully LG ULTIMATE 2 Review and Specs for Tracfone information can provide benefits for you in determining the gadgets that fit your needs in daily life. you just read LG ULTIMATE 2 Review and Specs for Tracfone if you feel this information is useful and want to bookmark or share it please use link https://innaz2.blogspot.com/2014/10/lg-ultimate-2-review-and-specs-for.html if you want more information please search on other pages this blog.